Serve with Badsberg Muscadel 2008. Serve with a yoghurt and muesli topping. Preheat oven to 180°C. Place halved guavas, flesh side up, on a baking tray and dust lightly with the cinnamon and sugar. Place a tiny knob of butter on each guava and roast in oven for 20-25 minutes or until soft and lightly caramelised. Remove from oven and set aside. Place the yoghurt into a glass bowl and add the orange and lemon zest. Add a squeeze of honey if needed. 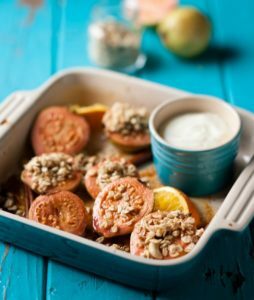 Serve warm roasted guavas topped with a spoonful of muesli and a dollop of zesty yoghurt on the side. Garnish with a swirl of honey and enjoy. This dish will pair well with a red muscadel or a tawny port.